Welcome to the Journal of Alternative Facts. They’re the greatest! And winning! Retraction Watch: What made you decide to create the journal? 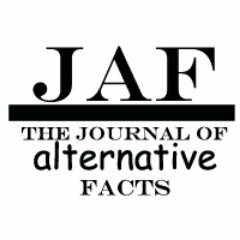 Journal of Alternative Facts: It is critical that there is a credible academic source for the growing and important discipline of alternative facts. This field of study will just keep winning, and we knew that all the best people would want to be on board. There is a real risk in the world today that people might be getting their information about science from actual scientists, or from fake news sources like The New York Times or the Proceedings of the National Academy of Sciences. In fact, this is such an important mission to us that not only are we an open access journal, but we are taking steps to ensure that we are the ONLY open access journal. RW: Tell us about your editorial board. We assume they’re the greatest, just terrific. JAF: Our editorial board consists of the greatest minds of American scientific thinking, primarily politicians. They are indeed the greatest. Terrific. Tremendous. We also have all the best peer reviewers, by which we mean PR reviewers. RW: Do you plan to apply for an Impact Factor, or can we just assume that it’s the highest Impact Factor ever, despite the fact that no one has ever cited any papers in the journal? JAF: You must be mistaken; we have the greatest citation counts. In fact, we have more citations than there were participants in the Women’s March. Perhaps your metrics are skewed because you are not properly counting tweets as citations. As you know, the government is moving towards conducting the majority of their business on Twitter, so it is appropriate for the academe to follow their example. If our impact factor is lower than it should be, it is clearly the result of rigged citations. RW: Does the journal have a retraction policy? JAF: Absolutely not. Here at the Journal of Alternative Facts, we do not believe in retraction. In the field of alternative facts, there are no mistakes or falsehoods, only facts that are appropriately alternative. In fact, we encourage submission of retracted papers from other venues to the Journal of Alternative Facts. Like many people, I was distressed and disheartened by the silencing of public communications from scientific agencies. Science is not a partisan issue, and neither is empirical fact. As academics and researchers we are sometimes at the mercy of government funding for our work, and I think there has always been a concern that politicians who may not have a good understanding of science might be making decisions that could impact the direction of scientific inquiry. This, combined with the realization that “alternative facts” may be part of how many people are starting to see the world, has led to a great deal of justified distress among my friends and colleagues. And sometimes the best way to make a statement about something is to point out the absurdity. It seems ludicrous that we would accept “alternative facts” as part of science, so why should they be part of policy? And I learned the last time that something I did went kind of viral (a remix of a book about Computer Engineer Barbie) that creative critique can be particularly effective. Besides, there are some times when you just have to laugh to keep from crying! greatest? No, Trumpest. “We have the Trumpest journal with the Trumpest minds and the Trumpest writing. All others are mere trumpests in a teapot. Cheers. The pincipal of charity does not apply to anything Trump…. President Trump will need the greatest, the really greatest alternatively factual and factually alternative scientificists on his team. The exciting new growth field – and I mean a really terrific, exciting new growth field, of Alternative Facts, has called my beckon, and I reckon I’ll harken to that beckoning call. Where do I sign up? 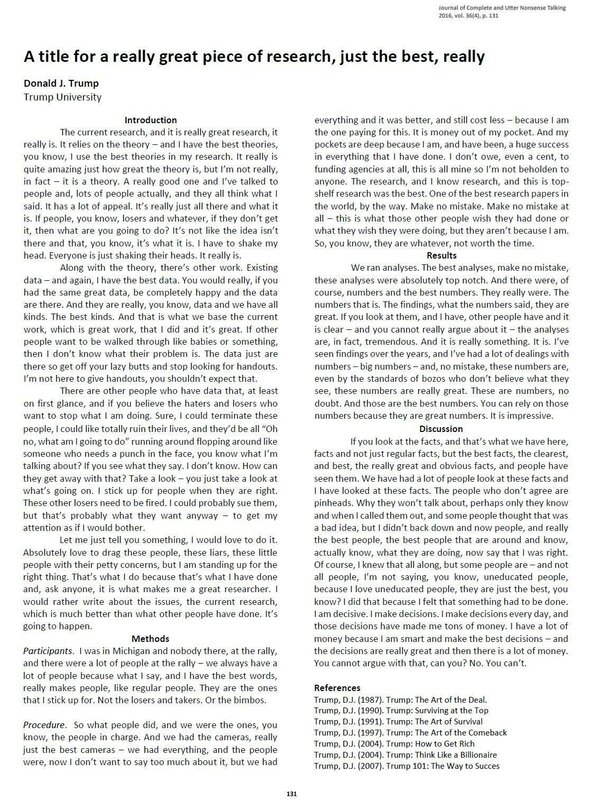 I see that the first article of the first issue of the first, and really, really terrific, greatest first journal of alternative facts, “The Journal of Alternative Facts”, has chosen to run the opinion piece, “A Title For a Really Great Piece of Research, Just the Best, Really”, by Mr. Donald J. Trump, of Trump University, in the inaugural issue. Now, yes, there were some issues with the inauguration, and they were fully addressed by pink-hatted street clinicians on Sat., Jan. 21, in the streets of Washington, D.C. That was a really, really great and terrific showing of alternative facts. Just the greatest. But I thought that I had come to expect better from the Journal. Perhaps in future these matters will be further studied in these terrific, really great pages. Let’s hope that the Journal of Alternative Facts is not just another emolumental undertaking. I see no reason you need to start with vol.1. no. 1. Start with whatever alternative numbers seem right. The year should be your pick, too. Spelling and grammar? Whatever. The late and (perhaps) great “Buddhist Third Class Junkmail Oracle”, an alternative newspaper published in Cleveland, Ohio, began its publication run with an issue denominated “last” and worked its way backwards (that is to say, counter-temporally) from there. It is good to know that there is still humor left in the world in the midst of all the insanity going on in our nation’s capitol. Jokes aside — being a psychologist, I have a hunch that the social sciences, coming from a completely different political direction, may have paved the way to what we presently witness, with their constructivist arguments about the nature of reality, facts, and findings. The Sokal hoax illustrated this. And Cixin Liu, in the Three-Body Problem’s first couple of pages, provides a chilling example how far the motivated denial of facts and natural laws can be pushed if the political climate is right. Time for a new climate science? I want to be sure I get my self-citations correct. Is the correct abbreviation for this journal “JAF” or “J. Alt. Facts”? The JAF is important in that it is documenting the first verified parallel universe. Let’s call it the Alt-universe. In the Alt-universe, Trump really is a genius, he really did win with the largest electoral vote, and millions of illegals voted for Clinton. In the Alt-universe thousands of Muslims really did dance in New Jersey on 9/11. In the Alt-universe Ted Cruz’s father really was involved in the assassination of Kennedy. And there really was a massacre in Bowling Green. In light of these revelations, Trump, Bannon, Flynn, Conway, et cetera are, in fact, invaders from the Alt-universe and have replaced their counterparts. If it helps, think of them as pod people. Their problem is that they have trouble distinguishing the Alt-universe from our Universe and, therefore, cite alt-facts that occurred in their universe but not in ours. Well, this makes as much sense to me as the alternative! Does this mean that we (one of us alt-scientists) can claim that we have published a “great” article in this alt-factual journal, and when pressed, refer to an issue that is entirely imaginary? That is, make up an article on the spot or even quote passages from the alt-article as needed to prove a point? Such an arrangement would allow one of us (those of us in the know, that is) to make up an article to reference our point (or point of view) and provide a solid backing for our alt-fact or, dare I say it, alt-point-of-view. That is, if I say the Earth is flat, I can reference it with an article detailing an expedition to the edge of the World and describing the conditions at the great waterfall there. The alt-article exists “only in my mind” and thus can consist of any “facts” I deem appropriate to prove my point. Surely this arrangement will be necessary to accommodate all the alternative points of view and alternative scientific facts that could potentially exist… that is, if the Journal wishes to really document all the alternate universes out there. The alternative (dare I say it) is to allow those who claim to be in possession of “alt-facts” to simply make assertions without backing them up with some sort of evidence… as is currently done with such alt-facts as the millions of illegals voting, in which there is no mention of any research or evidence backing up the assertion, or else the evidence is “secret” and known only to the assertor. I wonder what it takes to start an actual journal, of course facts are pricey, when you want to read studies from “conventional” journals many charge big bucks per edition. Hence this new journal will be the most expensive, research is expensive and must be financed somehow, and alternative research has to forge its own path because fighting centuries of suppression takes more money because alternative research is ground breaking (and costly). Is the word TRUMP going to emblazoned in gold on J. Alt. Facts’ cover? How come no updates in 5 months? You mean to tell me trump is both guilty and innocent at the same time. How alternative can we get. Without a fresh infusion of alternative facts to the journal i might have to vote anarchist next time. I prefer to think of him as neither guilty nor innocent. Next Next post: How did a book chapter end up with two authors who didn’t contribute to it?